This October we would like to introduce to you Table Talk by We Are Table. For six years, volunteers at Two Good have been providing a space for people from all walks of life. The volunteers help the community to create, grow, cook and share together, through a range of social outreach projects at St Canice’s in Rushcutters Bay. 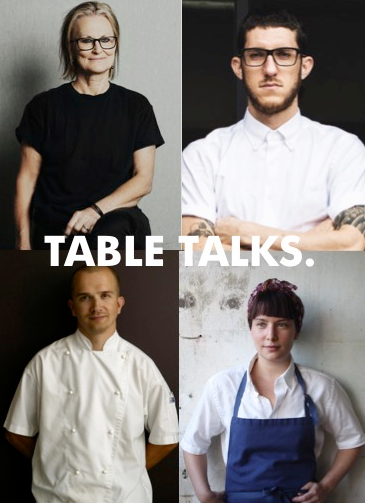 Two Good recently launched We Are Table and will debut their new event Table Talk, on Thursday the 27th of October. Table Talk will be hosting an incredible line up, with some of Sydney’s best culinary chefs, inspirational journalists, musicians and entertainers at the beautiful Carriageworks precinct in Eveleigh, Sydney. ACME and Bar Brose chefs Mitch Orr and Analiese Gregory will cook alongside Christine Manfield and Pasi Petanen to create an unforgettable dining experience. The food on the evening will be locally grown produce from Cana Farm and Feather & Bone, served with Australia’s best brews from Young Henrys, Young & Rashleigh, Madfish and Bibendum Wines. The fundraising arm of We Are Table is Table Cloth, where artists such as Nell, Mika Utzon Popov and Antonia Pesenti have designed table cloths for sale which will be displayed on the evening. We are proud to continue our support of We Are Table. Click here to buy tickets to the event to find out more about Table Talk. We Are Table is a great organisation made possible by the great work of their volunteers, visit their Facebook page here.